At any particular time, there will be a demand for various types of housing, from the low price category, through the medium price categories, right up to the most expensive. This will reflect the wealth and buying power of the potential customers. 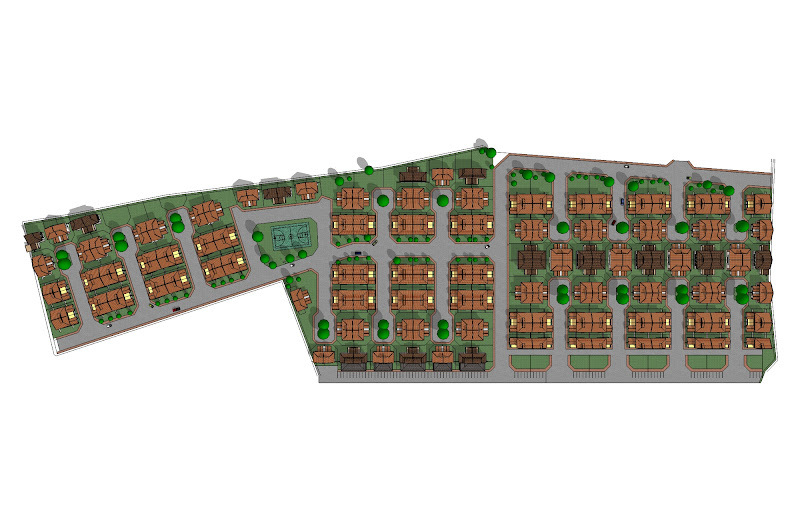 Take for example a 40 acre development in a small town that we are working on. This project can supply a big part of the town’s housing needs for possibly the next 6-7 years. In this situation, it makes sense to build as many house types as possible to correspond to what the people there can afford. If the development were to be built in 4 phases, then each phase of about 10 acres should have the full complement of price segments. Each phase then will have expensive houses in relative proximity to cheaper ones. It is possible to design the 40 acres such that the expensive houses are all on one end, and the cheapest ones on the opposite end. But connecting up the roads and other infrastructure from end to end would be more expensive than completing the infrastructure in compact 10 acre parcels. The design that we have come up with is a neighbourhood layout with a fine-grain mix of duplex, quadruplex and garden apartment units in each cul-de-sac. The price of the units that can be found in a typical cul-de-sac will range from RM 80,000 to RM 180,000 (USD 22,000 – 50,000).